On June 4th, the sun went completely spotless for the first time since 2011 and that quiet spell lasted for about 4 days, then at the end of June, beginning of this month it went completely blank again as the blank Sun gave a clear indication she is heading for a new solar minimum, but today she burst back with strongest solar flare since September 28th 2015. Spaceweather reports: STRONGEST FLARE OF 2016: Departing sunspot complex AR2565-AR2567 erupted on July 23rd, twice, producing two strong solar flares in quick succession. The first @ 0211 UT registered M5 on the Richter Scale of Flares. The second @ 0516 UT registered M7.6, making it the strongest flare of 2016 so far. 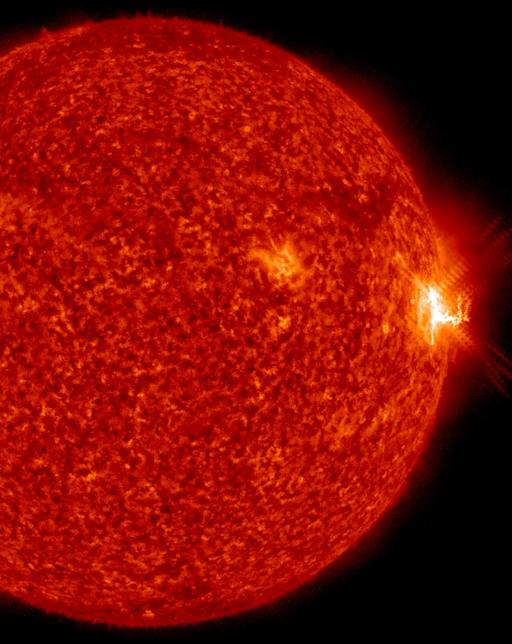 NASA's Solar Dynamics Observatory recorded the flare's extreme ultraviolet flash, see above. The explosions likely hurled CMEs into space. However, we won't know for sure until coronagraph images from SOHO become available later in the day. Stay tuned for updates.